So the aeroplane didn’t kill me. ​The screaming baby and crying mother next to me almost did though. I kept trying to smile at her to cheer her up, to show her there was some good in the world. She’d glance over, tears all rolling, and there I was with my kindest smile. She kept crying. 7 hours. An overnight flight spent watching films about corruption and not even nearly sleeping. At least there was a very questionable wet food served. Imagine humous with bits of weird black stuff in? That. Served with butter and jam. I asked for a beer and a wine. The wine was a bottle of white, with a bottle of red spilled all over the outside of it. I didn’t mind. Both went down nicely. The girl kept crying. Got the bags. Got a taxi. The driver didn’t talk at all. I like that. He did nod off though, doing about 80mph on a flyover. He can’t be falling asleep can he? Then he slammed on the brakes with nobody in front as he woke up. Several lorries swerved to avoid us. He’d been sleeping alright. I didn’t complain, don’t want to make a fuss. Vans full of chickens flapping about the humans. Vans of humans flapping round the chickens. This city is mad. The very definition of madness. I got out of the taxi, stood on the pavement, when a motorbike tried to run me over. Welcome to Bangkok. 6. A religious vision after the Night Train. Eric Simmons on 1. Welcome to Bangkok. Dom Ellis on 1. 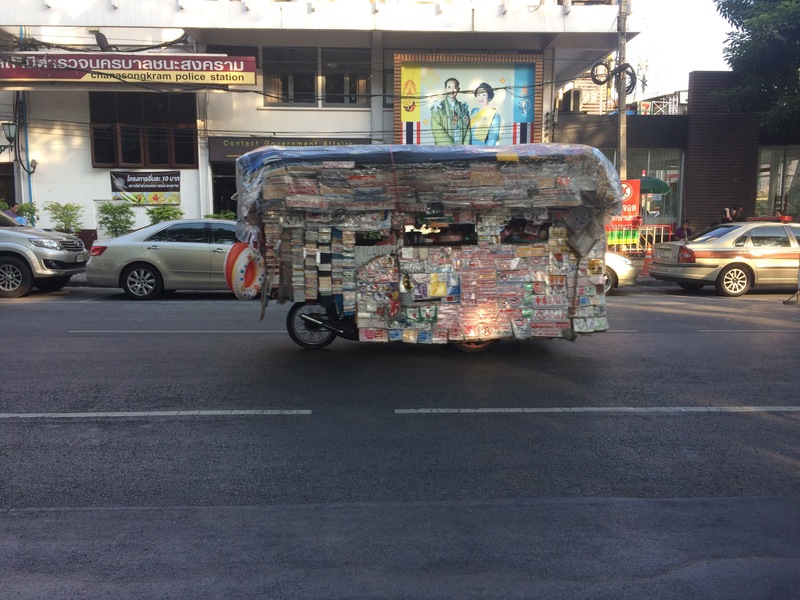 Welcome to Bangkok.